I was trying to compose myself in a stairwell the first time St. Mary the Virgin ever made sense to me. It was Christmas Eve, the first one since I’d lost my dad that July. At the great big, beautiful church where I served on staff, there was a full evening’s lineup of Christmas Eve services for the many people who would come to worship, whether they were Sunday regulars or just felt drawn to touch home base at a tender time of year. The choir had prepared piece after moving piece, familiar and new (if you think you’re busy in December, talk to a church musician!). The rector had preached a sermon that shattered me in the best way, connecting me with the wonder—love!—of God made known to us in human form, in Jesus. Family longings can be acute around holidays, and maybe that’s why Mary as mother of Jesus came to me in that stairwell between services. I don’t mean to say I had a vision, but more of a knowing: an assurance that wherever my dad was in death, it had to do with where Mary was too. Episcopalians don’t always know how to regard Mary; there’s a wide spectrum of thought, belief, and practice when it comes to ideas like the virgin birth of Jesus or praying to a saint. Traditions about Mary have developed over the centuries, beyond and apart from what we find in Scripture. What is vital to some is puzzling to others; motherhood and sexuality are powerful and complex parts of human nature. 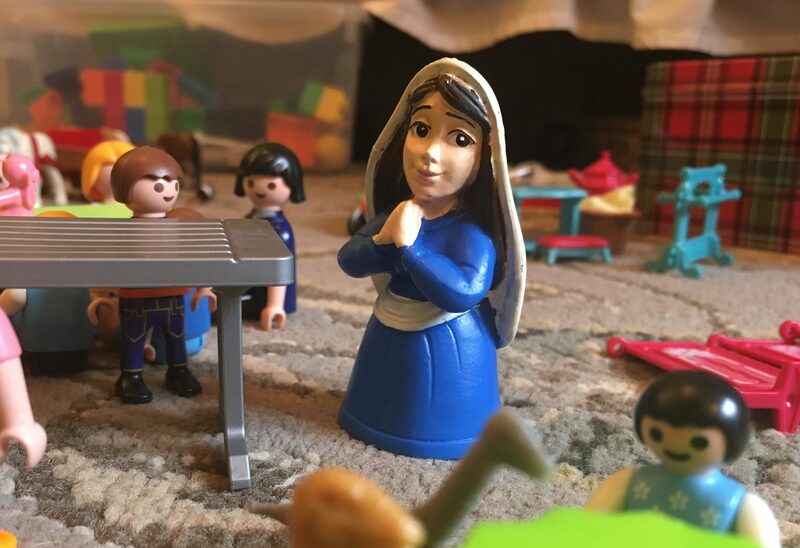 Sometimes it seems like popular theology peels off feminine attributes of God and sticks them on Mary—making too little of God and too much of Mary. Jesus is the mediator between God and humanity—we already have a Holy One who bridges for us the human and divine. Like all the saints, though, Mary can point us to God, draw us in. Saints—those faithful believers of ages past—can give us real-life examples of what it is to follow our Lord. We are enlightened by learning how others lived their faith in their time and place. Seeing other saints, we are encouraged to let the Gospel direct us in our own context. But there is something about Mary. Mary is unique in her role as mother of our Lord; she is sometimes called Theotokos, God-bearer. The gospels give us wonderful glimpses of Mary’s courage in saying yes to the invitation of God. Right from the start, the angel addresses Mary as “favored one” in Luke’s annunciation story, before she has even heard the pitch. What would it mean to be mother to this child? When the baby was presented in the Temple, the Spirit-led Simeon “blessed them and said to his mother Mary, ‘This child is destined for the falling and the rising of many in Israel…and a sword will pierce your own soul too.’” (from Luke 2:34-35). In John’s gospel, we find Mary standing near the cross where her son is being crucified, as Jesus commends her to the care of his beloved disciple. Art has sought to express the pain of the mother with the sword-pierced soul in the pietá, the image of Mary cradling her son Jesus after his death. A Mother’s Grief. Lamentation, by Pietro Lorenzetti, Assisi Lower Basilica, c. 1310-1329, in the Public Domain. Detail from fresco. Not every image and traditional tale of Mary speaks to my soul. But I am moved by the willing courage of a young person saying yes to God’s adventure. Can I consent to God being born in me, brought to others and made known in my life? I find the grief of a mother compelling, and—given my stairwell blessing, I discovered that grief to be full of grace and hope. I’m grateful for a church rhythm that visits and revisits the holy stories of that nearer-to-God way of being. And I’m grateful for Mary, still bearing God to us. How has St. Mary the Mother of Christ been present to you?